Rats were part of the lore of sailing ships in the old days. The creatures seemed to always be around ship’s galleys where quantities of flour, sugar, lard and other staples for preparing meals were stored. For some odd reason, sailors included them in their superstitions. They believed that rats were able to predict the future. When rats were seen leaving a ship, sailors believed it was a very bad omen and that the ship probably was going to sink. 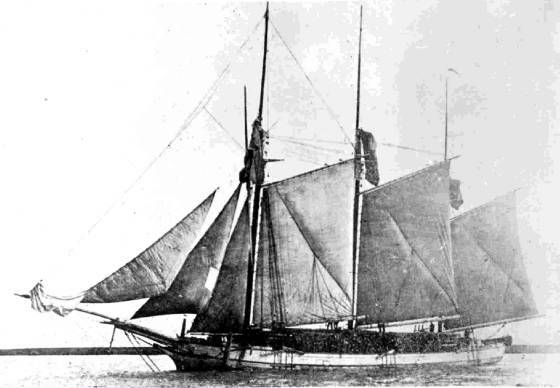 That is just what happened to the three-mast schooner Rouse Simmons as the crew was preparing it for a trip across Lake Michigan in November, 1912. The boat was sailing from Chicago to Manistique, Mich. to pick up a load of Christmas trees. Crew member Hogan Hoganson later told how sailors kept seeing the rats coming out of the hawser pipe and dropping into the water while the Simmons lay tied at the wharf. “All the way across the lake, as we sailed for our cargo, the old saying had kept ringing in my head. . . “the rats always desert a sinking ship,” Hoganson said. He said Capt. Charles Nielson, the ship’s master, also knew about the rats and reportedly told Capt. George DeMar of the Chicago harbor police that he feared it was a sign of bad luck. Nielson, 68, was an experienced sailor who understood the way of the lakes. He told his sister, Mrs. Alvida Verner, that he had a premonition that something was going to happen before he returned. But Nielson said he had promised Capt. Herman Schuenemann, the owner of the Christmas trees, that he would make the trip. “I know the Simmons isn’t safe, but I promised to go and I can’t go back on my word,” he told her. Hoganson worried about the vision of the rats until the Simmons got to Thompson’s dock at Manistique, and then he developed a new worry. He said he decided to abandon ship after watching Schuenemann overload the vessel with trees. “When he had filled the hold with Christmas trees, we were ordered to pile up a deck load. The load grew and grew and still they had us piling more and more trees on top,” Hoganson said. The Rouse Simmons sailed from Manistique, bound for Chicago on Nov. 21 with Nielson, Schunemann and nine other sailors aboard. She encountered heavy winter gales and never arrived at Chicago. The Simmons might have been seen once before it foundered. A schooner was seen on Saturday, Nov. 23, off Kewanee, Wis. The ship was laboring heavily in a gale of snow and rain and was flying signals of distress. Local lifesavers attempted to get a boat out but were driven back by the storm. All hope that the Rouse Simmons might turn up faded by Dec. 3 when wreckage, including quantities of Christmas trees, washed ashore at Pentwater, Mich.